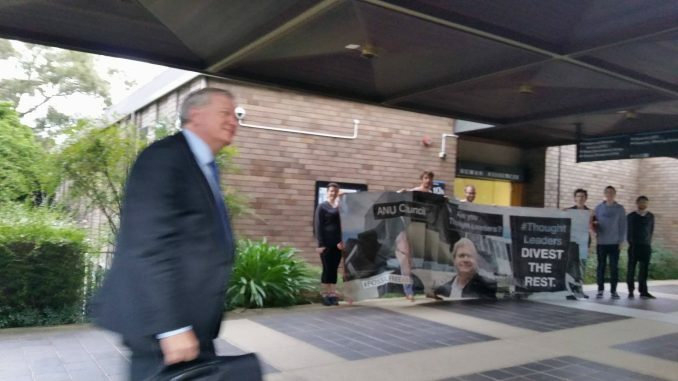 Fossil Free ANU held a protest outside the Chancellery yesterday, which Fossil Free spokesperson Bella Himmelreich claimed “locked down” the building. ANU, however, claimed it was a “peaceful protest” and did not acknowledge any security concerns. “The protest this morning was calling on ANU to stand up…by finally divesting their $40 million of fossil fuel investments,” Himmelreich explained. The ANU maintains that it is already leading with its Socially Responsible Investment (SRI); which describes ANU’s “deliberate policy to limit exposure to CO2 intensive industries.” However, Himmelreich said the group was also calling for transparency measures, such as releasing the ANU’s current investment portfolio. “Brian Schmidt publicly agreed to it in October 2016,” at the ‘Pizza with Brian’ event, Himmelreich claimed. The SRI update webpage has not been updated since April of last year. Fossil Free ANU has been campaigning since 2013 to compel ANU’s divestment from companies involved in the fossil fuel industry. In late 2014, ANU announced that it would divest from seven companies after adopting an ethics and environmental rating system for its investments, and give control of its investments to an external fund manager in compliance with these ethics principles.